Hi folks, Doc here. Here's a set that is a benchmark of the Classic Period of Gilbert Erector, the No. 7. "Steam Shovel" set. This pictorial features the No. 7 from 1926, the third year of the Classic Period. In 1924, Gilbert kicked off the Classic Period of Erector by introducing specialty parts to the Erector inventory that were designed to build a specific model, in this case the Steam Shovel. He packaged these parts in the set designated the No. 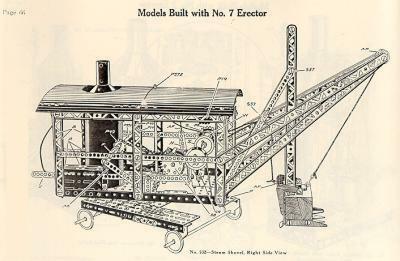 7, which would eventually come to be known as the "Steam Shovel Set" by fans and collectors. The No. 7 would later be followed by sets designed to build the White Truck, Zeppelin, Hudson locomotive, and others (I'll show you the Zeppelin set in another pictorial). The No. 7, while far from being the largest or fanciest Erector set, is one of my very favorites. Officially named the "Super No. 7 Erector," the 1926 No. 7 came packed in an attractive, stained and varnished wooden box with brass sidegrips and latches. The box measures 21½" x 8½" x 3¼", and fully packed it weighs a little over 13 pounds. The manual of instructions included with the set features the No. 10 Coal Loader model on its cover, as did all of the Classic Period manuals. Inside, the No. 7 featured a series of removable cardboard trays in which the majority of parts were arranged. The upper tray contained a carboard insert and a second cardboard tray with its own insert. The upper tray rests on top of four smaller trays and two small part boxes. The lower trays have no inserts - the parts are loose in each of them. The boiler and top, the P58 motor, and two of the three main digger scoop parts sit in the ends of the box, on either side of the two levels of stacked trays (see below). The photos below show the layout and contents of the removable trays. The upper tray held various pulleys, gears, and girders, plus two large black-painted base plates (under the C girders and 41-hole strips). The lower trays and small part boxes held everything else, including the remaining girders and pulleys, plus base plates, spoked wheels, turret plates, boiler stacks, and ladder chain. As I mentioned at the beginning, special parts were created specifically for use in building the Steam Shovel. 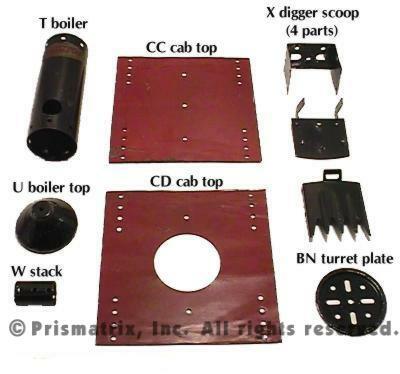 There were nine parts in all, including three new parts (plus one old one) to build the digger scoop. Of the nine special parts, four would gain widepsread use in other models over the years, and each one became a staple in the Erector inventory: the T boiler, U boiler top, W boiler stack, and BN turret plate. All nine special parts are shown in the image below. The two cab tops were stored beneath the 4 lower part trays. 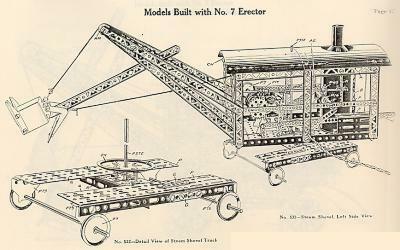 The instructions provided for the Steam Shovel in the 1926 manual (shown at right) were limited to two pages (shown below) showing right and left-side views, and a picture of the wheel assembly, or "truck." the model was complicated enough to warrant several detail views (this was true of many Erector models over the years). A variation on this design, not shown here, is also included in the manual. Visit my Model Gallery here at Girders & Gears to see a pictorial of the model.